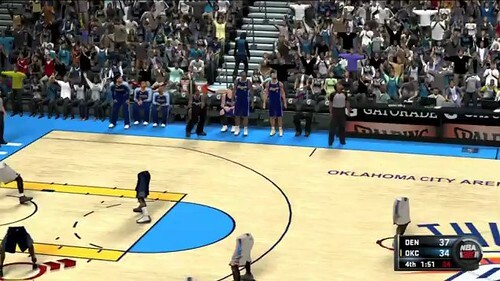 NBA 2K11 is possibly the most undeservedly praised game since Peter Molyneux’s disastrous Black & White. While it isn’t unusual for a sports game to get unearned praise – the Madden series is the most definitive example – but it is shocking that NBA 2K11 would get 90+ review scores from so many sites. This game is simply put, terrible. Despite not having played the NBA 2K series since 2K9, I’ve always been a huge fan of the series. Personally, the pinnacle of the series was the Dreamcast’s NBA 2K2, which featured some of the best gameplay I’d seen in a b-ball game, and had everything right; even rookies would be called out by their first and last name as if they had their own sound file. The control was smooth and satisfying, even more so than later editions – consider that the DC controller had only one analog stick. NBA 2K11 couldn’t wear 2K2’s jockstrap. It is simply a huge mess. First, we’ll discuss what is good about the game. The game presentation is top notch, especially in terms of the crowd AI. It reacts realistically, never resorting to boos until things really get ugly, and not in terms of the score. They’ll boo when the player or AI continually makes bad decisions, and a rout will only quiet them. In a tight game coming down to the wire, however, the crowd will explode, and gamers with good bass speakers will feel the roof rocking as they chomp and cheer. If it’s the player’s home crowd, nothing will get them more pumped. PC owners will find a truly beautiful game when playing the game on maximum settings, though in all versions, some players and coaches just look bizarre. Yes, I’m looking at you, Andrew Bogut. The “meet the press” portion of My Player in which you have to respond to press questions is actually quite involving; do you answer professionally? Loyally? Selfishly? Sometimes answering professionally, for example, will cause your teammates and/or fan base to dislike you a little more. And that’s where the good section ends. The rest is simply miserable, and makes people who play the game for a period of time wonder how long reviewers actually spent with the game before giving it a score. First, the game aspects that are completely broken, starting with passing. CPU defenders are worse than the NCAA defensive backs. They will make impossible steals. They’ll make steals with their back to the ball or leaping from midcourt to the sideline to snare a ball. It doesn’t help that the ball breaks all known laws of physics by travelling slower than a defender, who will run it down from behind. Worse, the player may have their player throw balls right into the chest of a defender, rather than lobbing it or bouncing it. Part of the problem is that the vaunted AI is all smoke and mirrors which becomes exposed when playing in “My Player” mode, in which the game will control nine of the players. When a gamer plays all five players, the game can hide its deficiencies, but otherwise, you can see the die rolls, and more importantly, when the game cheats. And oh how it cheats. When playing normally, a gamer might think they’re at least at fault in part. My Player shows that it simply isn’t true – teammates will brick easy shots no matter what the skill level, and the game even has the balls to label its comeback AI cheating as “clutch factor” in the game sliders. Of course, it only applies for the computer. How would you explain the Nets or Raptors coming back from a 18 point deficit against the Jazz or Lakers, hitting 95% of their shots while suddenly every human team player goes cold and hits 15%? There is no defense, there is only Madden-style cheating, with miraculous steals, bad passes, missing wide open bunny shots, and so forth – and this is on the easiest game mode. When on higher levels, the game becomes ridiculously transparent in its cheating. My Player can be ridiculously frustrating due to this. Being a point guard will be an exercise in futility since assists are artificially denied by either the psychic defenders, the receiving player waiting a few seconds to shoot, or merely bricking open shots. In addition, the player gets penalized for the most ridiculous “teammate” infractions. Is there such a thing as a “bad steal attempt” if it doesn’t result in a penalty or score? Or “bad blocking attempt”? Sometimes the game gets confused over who “your man” is when a player scores – is it the man you’re on? the man you’re assigned to? Sometimes it seems like you’re responsible for three players, even if the said player is a foot taller and an obvious mismatch. Even more howlingly bad is that the game will stick you in the game while injured, and somehow you’re blamed for players easily blowing by you while you hobble around. In one instance, a three point shooting point guard was blamed for “bad shot selection” will trying to hit a wide open three pointer down by five points with 40 seconds left. Guh? Then again, a 46 rated player will get significant minutes for whatever reason, and sometimes be asked to start. You can check out an example of how bad My Player is at times in this video posted by a gamer on YouTube. “Well,” you may think, “maybe online gameplay will be better, since there’s no AI involved.” You’d be wrong, because the game is near unplayable online due to lag. It’s not obvious lag, either. The game will seem smooth, but it’ll be impossible to steal the ball or hit jumpers. The most creaky of centers will be huge scorers, and Shaquille O’Neal will score 45+ points on a regular basis; anyone who saw him playing with the Cavaliers last year will find this amazingly idiotic. As for basic gameplay, it’s also a mess. 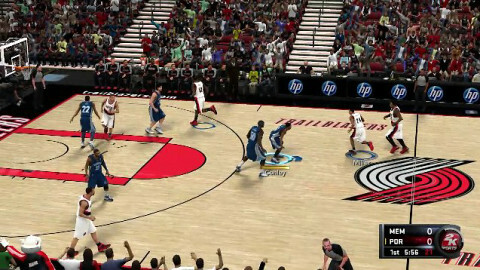 IsoMotion was reportedly dumped back in June, but unfortunately it was returned, and NBA 2K11’s control system is probably the most arcane and frustrating system one can think of. While it’s commendable that the game takes into play inertia, the effect is more like having human-controlled basketball players playing on an ice rink. Trying to juke and deke to drive to the hoop requires more effort than one normally would need; again, the same moves were made on a single analog stick without needing to resort to “IsoMotion”. There are problems that should have never escaped QA’s attention. AI players will sometimes hold the ball and stand motionless for 23 seconds before heaving a desperation shot. Sometimes an AI will inbound the ball by rolling it to midcourt, letting it sit there for anyone to grab.AI-controlled teams will change coaches five or six times in a single season. The AI will never get called for a charge, ever. There are graphical glitches such as one now-famous one in which the top halves of all player models will vanish, leaving the game to be played by ten legs in shorts, as seen above. 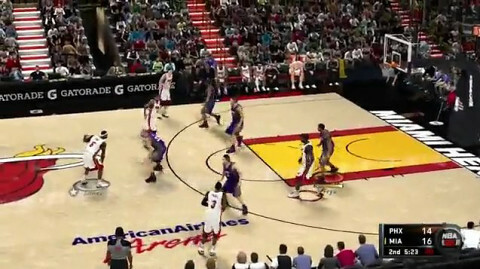 Another problem is a 2K Sports tradition: bad interface. As is usual for the series, it’s clunky and uninformative. One has to go through several layers just to see the roster and who is injured. The one saving grace of the game is that you can save mid-game and resume later, a feature all sports titles should have. There is no part of NBA 2K11 that isn’t broken or poorly implemented, and while the game has great first impressions, the more you play, the more you realize the game has more in common with Major League Baseball 2K9 than NBA 2K2. The developer has promised updates to the game, but frankly, this game needs an 18 month development turnaround rather than a yearly update like NHL 2K12, especially when that development time is used to stroke a retired player’s ego rather than make real improvements. As it is, wait before buying until it’s patched to a less annoying version.